Like Magic: The Tech That Goes Into Making Money Harder To Fake : All Tech Considered Imagine the Founding Fathers walking across the bills in your wallet. Like something out of Harry Potter, increasingly complex animation technology is being developed for use in paper currency. The redesigned U.S. $100 bills that went into circulation in 2013 incorporate technology that features several visual illusions, all designed to foil counterfeiters. In 2005, shortly after earning a master's degree in electrical and computer engineering, Sam Cape was looking for work online when he came across a cryptic help wanted ad. At his interview, he was shown something that blew his mind. Cape says it looked like film but was three-dimensional and appeared to be moving. It was in fact a prototype of a micro-optics technology he would go on to refine as the director of research and development for Massachusetts-based Crane Currency. Crane's history dates to the American Revolution. When Paul Revere prepared to take his famous midnight ride to warn of the approach of the British, he stabled his horses at a paper mill owned by Stephen Crane, who was also a freedom fighter. When the War of Independence broke out, Revere engraved the first printing plates, and Crane supplied the paper for the bank notes used to pay soldiers. In 1879, Crane won a contract from the U.S. Bureau of Engraving and Printing to produce the paper for federal bank notes, which it has been doing ever since. 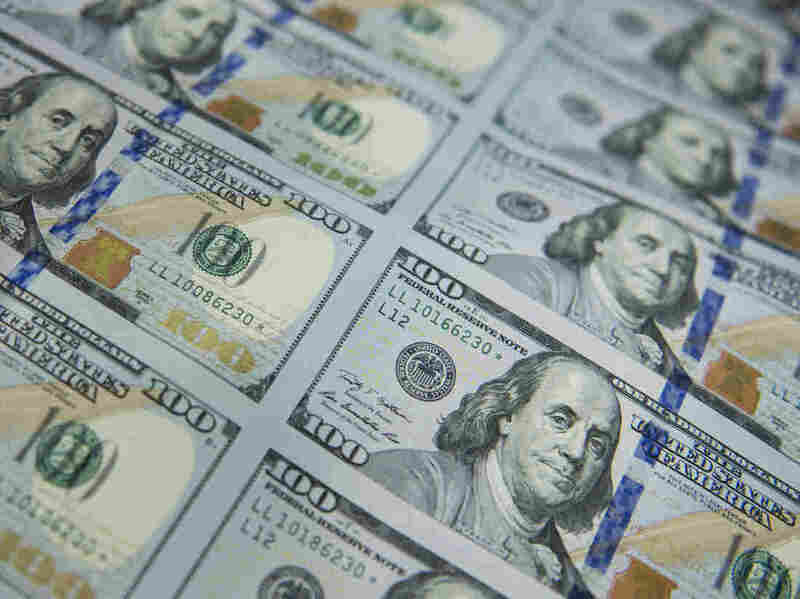 The company's motion technology has been woven into every $100 bill since 2013. Cape says the technology uses microscopic lenses so tiny you can fit about a dozen of them on the tip of a human hair. Nearly 1 million of these lenses are used to magnify underlying microimages on each of the newest $100 bills. The result is a visual illusion that looks a bit like the old 3-D tilt cards you might find inside a box of Cracker Jack. In the case of the newer $100 bills, the visual illusion appears on a thin blue 3-D ribbon right next to Ben Franklin's face. When you tilt the bank note, Liberty Bells on the ribbon seem to change into the numeral 100. If you tilt the note left and right, the images appear to move up and down. If you tilt the note up and down, the images appear to move left and right. It's one of more than a dozen stunning visual effects that also include a second, larger bell in an inkwell that shifts in color as it appears and disappears, and a security thread to the left of Franklin's portrait that glows pink when illuminated by ultraviolet light. Crane's motion technology is in use in more than 100 denominations worldwide, and Cape says further refinements are in the pipeline that will allow for larger images and more engaging three-dimensional effects. Imagine the Founding Fathers walking across the bills in your wallet or waving at store clerks when you go to make a purchase. Short movies may be possible, even interactive games — quick bursts of animation with striking effects. Most $100 Bills Live Outside The U.S. This may sound like something out of Harry Potter, but the new technology serves a very practical purpose: the deterrence of counterfeiting. To thwart would-be counterfeiters in the Colonial era, Ben Franklin himself made currency notes cast from the distinctive patterns of real sage leaves. It has become a lot harder to keep up with the bad guys — especially in recent years. "Decades ago counterfeiting was done primarily by large print shops that would do very large volumes of notes," says Len Olijar, the director of the Bureau of Engraving and Printing. "Today, domestically in the United States, the counterfeiting threat is increasingly becoming scanners and printers, and people printing a few notes at a time." To meet the challenge, Olijar says, some of the latest security features aren't even readily apparent. They're meant to be read by machines rather than humans. And, he says, one of the most effective security features isn't new at all: It's actually the currency-grade paper itself, which is made of a durable blend of cotton and linen that has a distinctive feel, enhanced by a raised printing process. The Bureau of Engraving and Printing prints billions of dollars a year. There is approximately $1.53 trillion currently in circulation. The Federal Reserve sets the number of bank notes printed, typically in the range of 24 million per production day. But this year natural disasters have increased the need for paper currency, and the bureau is expected to produce approximately 31 million notes per day in fiscal 2018. The Bureau of Engraving and Printing has facilities in Washington, D.C., and Fort Worth, Texas. Both offer public tours. Cape notes that the paper is also less available than the plastics used in polymer bank notes, which makes it harder to counterfeit, and it has other advantages. Paper currency can still be exchanged when the power goes out, when hackers strike, when anonymous but safe transactions are desired. No matter how sophisticated motion technology becomes, Cape says, the goal is quick and reliable validation of bank notes, not merely entertainment. According to Olijar, less than 0.01 percent of the notes in circulation are counterfeit. He says robust security features help to maintain confidence in U.S. currency here and abroad, where more than half of U.S. bank notes are held, including some 12 billion $100 notes in circulation. Unlike digital cryptocurrency, Olijar says, U.S. paper currency is widely considered a dependable store of value, "good today, good tomorrow, and good forever." Allyson McCabe is a journalist based in New York City.